Invisalign is a modern tooth straightening concept that uses a series of clear braces which are virtually undetectable when smiling and talking. They are comfortable to wear and can be removed anytime when eating or cleaning your teeth. Clear braces are now becoming more and more popular especially with adults. Unlike conventional braces, there are no metal brackets or wires attached to your teeth. Invisalign involves creating a series of bespoke aligners which gradually move your teeth towards the desired position. Braces will be replaced every two weeks and our dentists will monitor you’re the teeth straightening process ensuring your treatment is on course to achieve your new look. We are proud to offer free consultations to discuss straightening crooked teeth. At Mount Road Dental Surgery our dentists will carry out an initial smile assessment and discuss whether Invisalign is the best option to create the smile you wish for. If you would like to know more about clear braces and how Invisalign can work for you, please fill in the form today and we will contact you to arrange a consultation. Upto 50% quicker treatment times with weekly aligner changes. Invisalign from £2,000 (express single arch) = £62.58 per month based on 36 monthly repayments at 7.9% APR. For more information on 12 Months Interest free finance. View our case study results of Invisalign Treatments. Invisalign aligners are virtually invisible and are removable giving you the flexibility to eat and drink what you want during treatment, you can also remove the aligners to brush and floss as you normally would. Unlike traditional fixed braces, there are no metal brackets or wires. 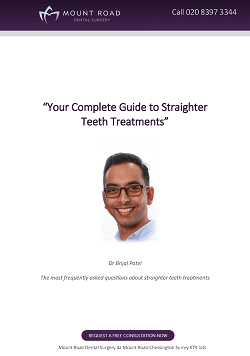 For more information on Teeth Straightening or to book a consultation call us on 020 8397 3344.